The biggest hunk of them came in reaction to advancing LGBT rights. As of this spring, more than 100 bills sought to legalize discrimination against LGBT people in one way or another. One of the most restrictive was Mississippi’s H.B. 1523, which was signed into law in April and allows both government and private business to deny a range of services to LGBT people, and also creates legal safeguards protecting those entities from being sued for discrimination. 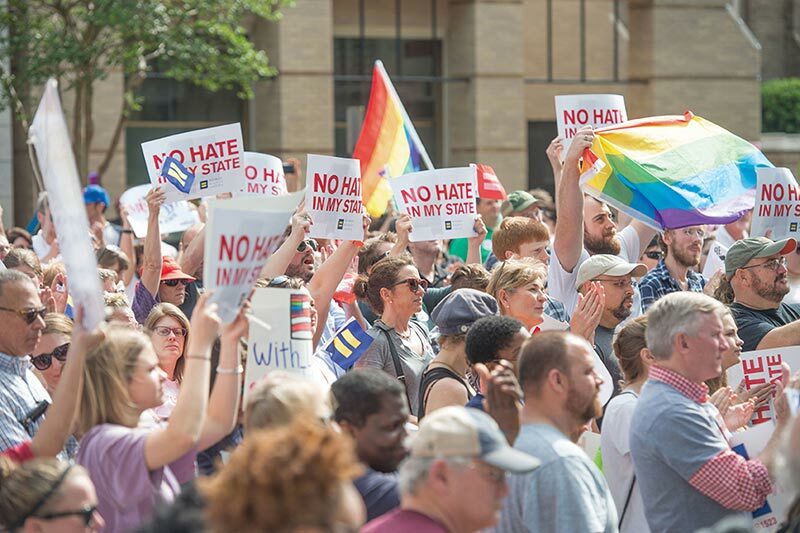 Mississippi burning: The Human Rights Campaign organized a major rally in May against Mississippi’s latest draconian anti- LGBT legislation. North Carolina’s H.B. 2 took just 12 hours to win legislative approval. It removes protections for LGBT people, denies transgender people access to the bathroom matching their gender identity, and bars any claims of discrimination under state law. Georgia’s H.B. 757, which also allowed denial of services to LGBT people on the basis of religious belief, passed the legislature but was vetoed by Gov. Nathan Deal in March. Tennessee’s S.B. 1556, allowing therapists to refuse LGBT and other clients on the basis of “sincerely held principles,” became law. Oklahoma was something of a record-setter in this regard, with 27 bills offered this year. One would have allowed any business to refuse service to LGBT people. Another would have made it illegal to ban “reparative therapy” — which purports to be able to “cure” gay people — as five states and two cities have already done in the case of minors. All 27 bills, however, died in the legislative session. Meanwhile, more than 30 states sought to bar Syrian refugees in the aftermath of the Islamist attacks in Paris last November, despite the fact that the states have no jurisdiction over refugee resettlement and cannot ban it. A particularly extreme case came in South Carolina, where S.B. 997 would create an online registry of refugees’ personal information and hold refugees’ sponsors liable for any crime committed by their charges. The bill was referred to the Senate’s Judiciary Committee. In Florida, H.B. 1095, the “Prevention of Acts of War” bill, would allow the governor to use police and the National Guard to keep refugees from any nation where terrorist groups exist from entering the state and would prohibit state officials from helping integrate refugees. Arizona, Kansas, Mississippi, Missouri, Nebraska and Tennessee saw bills similar to those in Florida and South Carolina. Eight Western states also considered some 30 bills that were aimed at removing control of public lands from the federal government and turning it over to the states, even though a series of legal cases in the 1980s established that those lands are legally under the control of the federal government. In addition, a federal law that would strip the federal Bureau of Land Management and U.S. Forest Service of their law enforcement functions was introduced in Congress.